Our classroom reading nook is one of our most popular literacy stations. Before school started I spent time going through our classroom library and organizing the books by topic and reading level. At the beginning of school I surveyed the students about the types of books they liked to read and the things they wanted to know more about. By observing and listening to the students I keep a close eye on the books that are generating the most interest. I also include books that coordinate with the Science/Social Studies units we are currently studying. By limiting the amount of books they have access to, students spend more time reading and less time “grazing”. Also, by having books always rotating in and out students always have an opportunity to find something new to read. 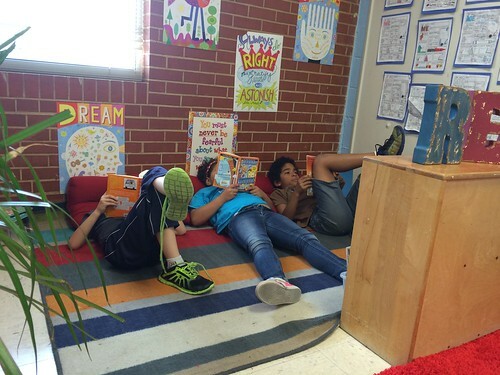 Students especially enjoy having a quiet place to stretch out and be comfortable.